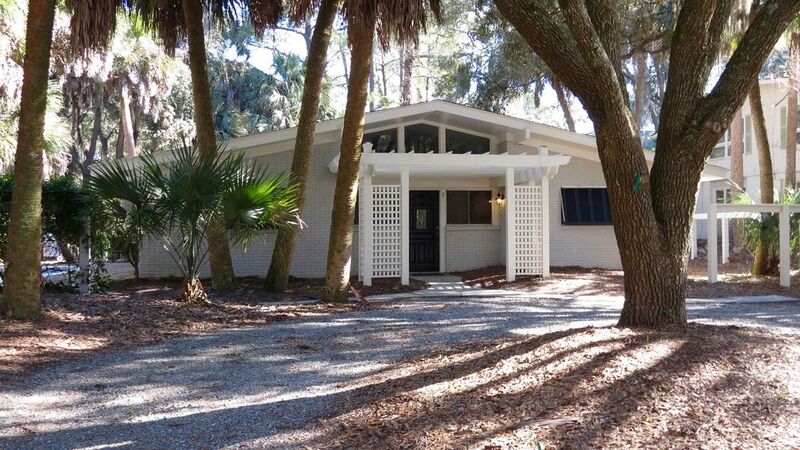 Located 100 yards from the best beach on Hilton Head Island, this four bedroom, three bath home is in the quiet South Forest Beach area, yet is only minutes from golf, tennis, shopping, and restaurants. Biking around Hilton Head is enjoyable on the nearby bike paths. Newly renovated in 2015,The White House features fresh new decor and an upgraded kitchen. The White House is one of the few Hilton Head beach properties that is all on the ground floor, so there are no steps to climb. Enter through a trellised walkway and enjoy the decor of calming colors, textures, and fabrics along with the spacious vaulted ceilings in the family room, kitchen, and dining areas. The tiled floors, and granite bathroom counters combine to add a touch of elegance to the spa-inspired decor. Each bedroom has two six-foot windows and there are three sets of six foot sliding glass doors opening onto the 28 foot long pool, creating a light filled retreat. After returning from the beach enjoy the private outdoor shower. The master bedroom has a king-size, bamboo canopy bed and a private bath. The second bedroom has a queen-size bed, a private bath, and a sliding door that opens onto the pool. The third bedroom has a queen-size bed and a shared bathroom that is handicap accessible. The fourth bedroom is a 'bunk room' having two sets of bunk beds a sofa and a TV/VCR, toys, games, and puzzles. The living area overlooks the pool and has a large sofa and three armchairs, as well as an entertainment center with TV/VCR/DVD and a stereo with CD player and radio. Adjacent to this living area is a dining table with seating for eight and a view to the pool as well. There is additional seating for six on bar stools at the kitchen island countertop. The kitchen has a refrigerator with ice maker, tiled countertops, and is fully-equipped. For quiet relaxation and family fun, the entry foyer includes a queen size pull out sofa bed and two chairs. Additional dining capacity and the perfect place to play games is provided by a lovely table and six chairs. Enjoy a full day at Hilton Head's renowned beach and come home to a relaxing pool with lounge chairs, gas grill, dining table and chairs. If you decide to bring a family pet, there is a safe, fenced in dog run in the back yard for your special sidekick. Hilton Head has miles of bike trails, as well as many other family entertainment options. If you don't want to cook, no problem, Hilton Head has many restaurants to fit your taste and budget. Experience Hilton Head - you'll be glad you did! Gary and Kathy love to cook, enjoy walking on the beach, playing tennis and exploring the low country from Savannah to historic Charleston. Our family has been vacationing on Hilton Head Island for many years. Our children enjoyed the island so much that we decided to invest in our own private 'get away' home. Located only 300 steps from the beach, our home allows maximum enjoyment of Hilton Head's beautiful waterfront. The White House is conveniently located for shopping, restaurants and most important - the beach! We know you will enjoy the privacy and relaxing atmosphere of our home as much as we do! One Bathroom includes 'roll in' Handicap Accessible shower and toilet. Our home is only 300 steps from the ocean! 15' X 28' - Depth ranges from 3' to 6'. Three steps at entry. We loved the location and close proximity to the beach. We had a few issues when we first got there and the owners were very prompt and follow up was great. Great location with easy access to beach. Our party included a 3-year old and an 83-year old and it was an easy walk for them to the beach. The house is a bit dated in terms of decor but was clean and everything in good working condition. The property owners were responsive and great to deal with. Everything was perfect! The owner was very accommodating! We had a great week! This house was perfect for our family! It is very close to the beach. It was perfect. We had all ages, most couples had their own bathroom. The outdoor shower space was great and it’s just a few steps to the beach. Loved it and so close to the beach!!! Gary and Kathy’s house is wonderful!! We had 11 people and totally loved that we could all stay together to celebrate Papa’s 80 Birthday! Loved that we could ealk to beach in just a couple of minutes. The house is very well stocked and very clean. The wifi / cable lines had been cut from some workers doing work on their street. We called Kathy and Gary and they had the lines fixed in less than 24 hours. Very impressed with their responsiveness to all of our needs. Great place, love to come back again soon!! Thank you and wishing you both the very best! !